Teesdale Studios boasts beautiful porcelain ceramics that reflect nature. Artist Katie Teesdale is inspired by her surroundings, bringing life into her pieces with colors of frozen lakes, textures of leaves, and raw organic edges. Katie's ceramics are both stunning and functional for every day life. Her work seems to be a reflection on the beauty of Minnesota, and we love her interpretation. My name is Katie Teesdale and I am the artist behind Teesdale Studios. I create wheel thrown and altered porcelain ceramics. My artwork’s focus is on creating collectable functional artwork for the home. What's the latest thing you have been working on? I’ve really been focusing on how to create new vases and flower bricks (a vase designed to hold floppy flowers like tulips). I like how different styles really resonate with different people, and how I can really create a variety of things without drifting too far from “my style”. Will you be featuring any holiday items? Yes! This year I will have a new line of holiday ornaments that I will be unveiling in late October. I didn’t have access to a pottery studio until I went to college. I ended up in a ceramics class as a part of my Art Education requirements. I immediately fell in love, switched my major from painting and never looked back. The colors of Hutchinson, MN really drive what I look for in my pieces. Especially as the seasons change, I find myself wanting to develop the colors of the world outside my studio window. How do we grab that sunset, or that frozen lake? Ceramics can be a very repetitive process, so I take that time to medatate on habits both of my mind and body. I find that clay can help a person find that state of “mental flow”, which is incredibly restorative. Check out more of Katie's work online, and be sure to stop by her booth at the Minneapolis Gift & Art Expo, November 3-5, 2017 at the Minneapolis Convention Center! Big Oak Press is the work of Eric A. Johnson, an artist who has been printmaking for nearly 20 years. His experience spans all types of printmaking, but his focus has been on creating block prints with a single block for all the colors in the image. His work is colorful and intricate, and the imagery is both organic and full of energy. We are amazed by the amount of color and detail in each print, and his process of creating is an art form in itself. My name is Eric A. Johnson, I am an artist/ printmaker from the Fargo, ND area. Although I create with and teach different areas of art, my primary focus has been printmaking for the last nearly 20 years. There are four main areas of printmaking; relief, screen print, intaglio, and lithography. I work mostly in relief focusing in on something called the reduction or reductive process of creating color images. The process uses one block to print all the colors instead of a block for each color being printed. My first memories of making something was as a child drawing on the floor with one of our cats on my back. I was probably about four or five years old. I don’t know if I have one specific moment! In general something I’ve found to be great is having people come back years later and commenting on how much they still like something they’ve purchased from me. Well my five year goal was to have a home studio set up; and while this was a great thing to shoot for, it didn’t quite happen so I would love to make it happen between now and three years from now! “Big Oak” Press comes from a print I made of a tree (the sketch for it is now my logo and chop mark) in which I wanted to include something in Norwegian. My Mother came to North Dakota when she was 16 and we still have a lot of family there. I had just planted some Bur Oak trees on the family farm so I was thinking of Oak trees and thought it would be a cool name for my press (even though at the time it was still a long term goal to have my own press). So in this print I included “Stor Eik” (Big Oak) at the top. Check out more of Eric's work online, and be sure to stop by his booth at the Minneapolis Gift & Art Expo, November 3-5, 2017 at the Minneapolis Convention Center! Angie and Chris Whelan made the big move from urban life in Las Vegas to rural Wisconsin, and their homestead became a place to explore every facet of their creativity. They started a line of bath and beauty products called YB Urban? and Angie designs textiles for her line "Breed Fashion." They work to create products that are natural and sourced from their own farm, and they have big plans to expand in the future with even more locally sourced ingredients. We admire their mission to provide a space for community and growth, and their care in creating products to promote joy and wellness. We are Angie & Chris Whelan from Ellsworth, WI! We have a creative homestead called YB Urban? on 5 beautiful acres in the El Paso township where we currently grow food, raise chickens, cats & kids, and create 2 handcrafted product lines. Breed Fashion is a textile art endeavor created by Angie. It started with kids clothing and is ever-expanding into artfully inspired accessories, jewelry, and home décor. Our YB line is a collection of natural personal care products made with very high quality ingredients, creative essential oil pairings, modern design, and clever names! We quietly tested 2 special holiday YB Chapped? lip balm flavors last year and they were such a huge hit, we will be offering them at the Gift Expo this year! "Cranilla" is a sweet, creamy mix of cranberry and vanilla, while "Santa's Revenge" is a mix of all the sweet tastes of Christmas for all the nice, but just enough spicy "bite" to make up for the little bit of naughty in all of us. They make perfect stocking stuffers! We also always put out a great mix of gift sets. Since our goal is to create a very boutique line of products, we avoid making every product in every scent, but we always make a point to have items in different categories that pair well together. These make great gifts for family, friends, teachers, caregivers, and party hosts. Don't forget the kids! Our building block soaps come in packs of 7 (one of each color) at the holidays, each individually wrapped, so every grandkid can have their favorite scent! So many things! I remember as a kid whenever I would go to a festival in Duluth and see all the tents with artists and food vendors I thought I would love to be out in the sun, with all the energy of the crowds, selling something I made! And it is ALL of that and meeting so many great people...people who appreciate the beauty of handmade things and the artists who spend their time doing something they love. It's a beautiful collection of minds and hearts at craft shows, from the vendors to the attendees. Everyone who comes to a craft fair shares a mutual respect of art, entrepreneurship, and originality. My least favorite thing is how much money I always end up wanting to spend on all the amazing stuff! Pair an amazing piece of handcrafted art with a memorable conversation, and it's pretty hard to resist taking something home! We were living in Vegas 4 years ago when we started talking about homesteading. One of the most appealing things to the multipotentialite in me is the idea of having multiple jobs, businesses, or just income streams in general. I decided to start with a handmade kid's clothing line since I was already obsessed with making dresses for my nieces and daughter! I had started selling my clothes at events in Vegas and on Etsy when we decided to make our move in 2012. Coming here put me all in, and I made a full time job of doing festivals and working on our website. Though the first few shows I did here were better than Vegas, I knew if this was going to be lucrative I needed a product that everyone wants. Chris and I discussed how we could expend and he let me know he's always wanted to make soap and call it "YB Stinky?". After exploring all the products we could come up with (YB Dry? lotion, YB Chapped? Lip Balm, etc) we had to name our new company. YB Urban? ties together our movement from inner-city Las Vegas to rural Wisconsin and starts telling our story for us. On our homestead, interconnected with all aspects of our lives. I see us raising bees and using that beeswax and honey in our products. Next spring we would like to get a couple of sheep so we can use the wool for our wool-wrapped soaps. We'll plant luffa seeds in hopes we can self-supply luffa for our scrubs . We'll continue to use what our land can provide in new products or completely new endeavors. We are planning the addition of an outbuilding on our property that can serve as a creative kitchen production space as well as a classroom to gather people from our community together, teach each other new skills, and have a place where we can all self-sustain. And my biggest goal, my only true requirement for success, is that every person (or animal) who comes to YB Urban?, whether to visit or to stay, experiences kindness, eats plenty, and never leaves empty handed. All my textile creations are near and dear to my heart. Anybody who has made clothing can attest to the time and effort it takes when you are making the entire thing from start to finish. With our bath and body items, I personally love our YB Tense? body oil blends. We put so much thought and research into the formulas, choosing every oil carefully to bring about the right texture so it feels good, the right blend of essential oils so it smells fabulous, and the right mix of everything to bring about all the benefits of the oils for the body, mind, and spirit. They are versatile and can be used everyday as a full body moisturizer, in massage, as a bath oil, or even a hair and scalp treatment. We have 4 different scents to choose from and I love them all! I (Angie) had an awesome job in Vegas. Before we moved I was the creative director for a non-profit company where part of my job was to come up with handmade items we could teach adults with disabilities in a supported work environment how to make and sell. It was a very entrepreneurial company that centered around creating work based on individual interests. 2 of the skills we were able to introduce were sewing and creating bath products. I loved learning from the staff and clients in the company, we had so many talented people! I was able to gain a lot of new skills through experimentation and research, as well. I loved watching things I created to pass along morph into something new based on the individuals who were making it, but I also yearned as an artist to be a part of that end result. When we moved to Wisconsin I knew it was our turn to see how people would react to the creations as we envisioned them. I have been sewing since about the age of 12 and I have been studying and using essential oils for almost 20 years. 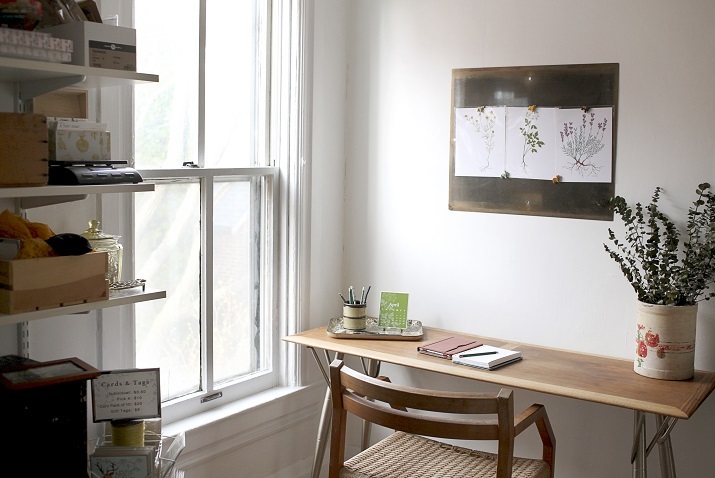 I love taking traditional, age-old homestead crafts and bringing a minimalist-modern flair. I think we as a family are a mix of modern and vintage, and I think all of our creations reflect that. Check out more of Chris and Angie's products online, and be sure to stop by their booth at the Minneapolis Gift & Art Expo, November 3-5, 2017 at the Minneapolis Convention Center! Tess Wilson is a fiber artist who loves to create functional art. From rugs to wearables, Tessere Fiber Arts fuses a traditional craft with modern designs and colors. We think it's especially cool that Tess makes textiles using recycled fabric, so your favorite tee or worn out jeans can become something new and exciting. "Tessere" is the Italian verb meaning "to weave," so it's clear that Tess was born to bring this art form new life with her beautiful designs. My name is Tess Wilson and I am fiber artist. I’m primarily a weaver but I also felt, knit, sew, and spin my own yarn. Weaving sits at the intersection of functionality and art; it combines inspiration and design with craftsmanship and skills to create one of a kind pieces that can be touched, worn, or even walked on. I love the concept of functional art and I strive to make all my pieces are both beautiful and useful. I’ve been designing and creating woven art for nearly four years now. I was tentative about selling my work but, as I was researching potential names, I came across the Italian word Tessere. It spoke to my heritage, contained my name, and translates to “to weave”. I took that as a sign that this was meant to be and haven’t looked back since. My favorite items to make are my rag rugs. All the fabric I use is upcycled, ranging from old sheets, to ripped blue jeans, to outdated leather upholstery samples. There is nothing more satisfying than giving new life and purpose to something is set to be thrown out, especially when it’s fabric that holds memories. I have a rug made out of my dad’s favorite jeans, another that features the hot pink sheets I loved in high school. I offer custom rugs where I turn your fabric into a durable piece of functional art that will last for years. Weaving is an ancient art that is intertwined in everyone’s daily lives. How many machine woven items have you touched today? Your clothes, that blanket, the upholstery on the couch, it’s ubiquitous but often overlooked. Even as a traditional craft it isn’t as widely practiced or taught anymore; at craft fairs I hear so many stories about grandfather’s who owned a loom or a great aunt that loved to weave but it’s always generations removed. As a 25-year-old, I’m far outside everyone’s mental image of a weaver. I try and infuse the traditional craft with modern designs and colors to keep my pieces trendy. My favorite part of craft fairs is engaging with customers. I always bring my loom to demonstrate and teach weaving to further the awareness of the craft. I especially love talking children through the process and watching their amazement as the designs appears as I pick up seemingly random strings! For this craft fair, I’m making special sets of needle felted ornaments. Needle felting is the tangling of colored wool with a sharp barbed needle to create soft figurines. To learn more, stop by my booth because I’ll be demonstrating the process throughout the day. I’ll have penguins, snowmen, reindeers, and Santas. For $8 each, they make perfect little stocking suffers! 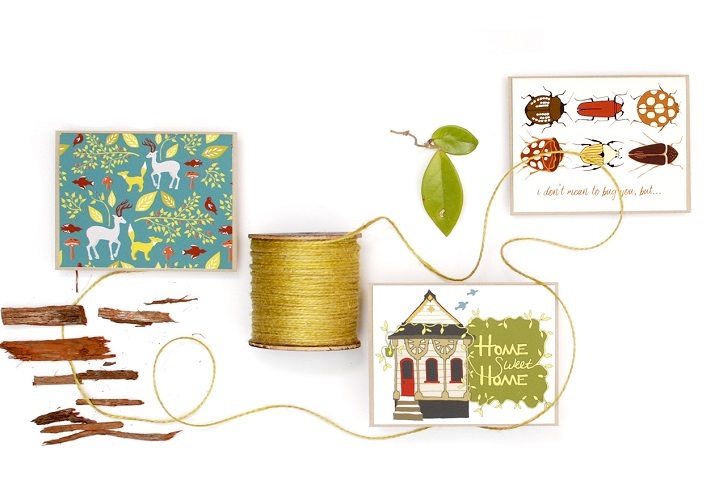 Check out more of Tess's products online, and be sure to stop by her booth at the Minneapolis Gift & Art Expo, November 3-5, 2017 at the Minneapolis Convention Center! My Naptime Jewelry is a handcrafted collection of Essential Oil Diffuser Jewelry made with genuine volcanic lava stones created by Michelle Stangl. Her jewelry is designed to look (and smell!) great wherever you go; just one drop of essential oil can provide aromatherapy for weeks. What once started out as a form of self therapy, has now grown into a passion and a mission of hers. Michelle aspires that women and men around the globe will discover the powerful benefits of aromatherapy and be able to enjoy it through the use of My Naptime Jewelry's Essential Oil Diffusing Jewelry. My name is Michelle Stangl and I am the owner and designer of my naptime Jewelry. I design essentials oil diffuser jewelry using volcanic lava stones. You just put one drop of your favorite essential oil on our volcanic lava stones; the oil is soaked into the stone, your body heat warms the oil, leaving your favorite aroma to be released throughout the day. Lately I have been working on our new collection. It's a compilation of necklaces featuring hand cut lava stone pendants electroplated in silver gold and Rose gold. It's really cool because each lava stone is hand cut, and exclusive to my naptime Jewelry, so we know that no one else has the same lava stones that we do. This also means that you get a one-of-a-kind piece every time. I started my naptime Jewelry during my son’s naptime in 2015 when he was just a baby. I felt like I needed a creative outlet that we would help me to relax during that quite time. I had made jewelry in high school to help relieve migraines, so I dug out my old tools and started creating things! Why did you start working in this craft? Started making jewelry in high school when I noticed that my chronic migraines disappeared during an art class while making jewelry! So, I made A LOT of jewelry in High School. It was the only thing that helped. Most of our community is not familiar with essential oil defusing Jewelry, they're familiar with the two apart from each other, but not together. It's a new product for them that they didn't know they needed but once they have it they can't live without it! My favorite moments are those times when I get an email or message from someone who has bought my jewelry, used it and it has change their life. I get messages daily from cancer patients, Women diagnosed with anxiety or depression, ADHD, even blind and deaf clients; that have said their new jewelry has helped them in so many ways. It's really unbelievable some of the stories they share with me! And I never thought that by doing something I love so much, I could be changing peoples lives. Check out more of Michelle's products online, and be sure to stop by her booth at the Minneapolis Gift & Art Expo, November 3-5, 2017 at the Minneapolis Convention Center! Helga Lange got her start working for designers in New York, and she has taken her experience and love for apparel design to a relaxing new level. She began her brand Radiate Activewear after discovering a need for better compression shorts for hot yoga. After the prototype for men's shorts was a success, she expanded the line to women's pants, tops, and apparel. Say "namaste" in style! My name is Helga and I have always loved designing clothes. I lived in NYC for 15 years and designed for Anne Klein, Jones New York and Randy Kemper. It was an incredible experience and shaped my creative process. Since I moved to Minneapolis, I was taking yoga classes to connect with my new community. My husband is a local yoga instructor, and I noticed that the options for compression shorts in the hot yoga market were few. I knew I could design something better and started to prototype men’s shorts for Radiate Activewear. Today, it’s more about women’s activewear and lifestyle clothing. What’s the latest thing you have been working on? My latest design was inspired from the infinity scarf. I added some sleeves and a body, the Infinity Wrap was born. The garment can be worn two different ways, open front as a cardigan or wrapped across the body for a modern, casual look. Both silhouettes look amazing on lots of different body types. I love when a well designed product gives a gal options. My customer’s are visually drawn in by color, fabrics, and graphic designs. Touching the clothes as they shop, commenting on the softness of our fabrics. Clients relay how our designs are stylish, wearable and flattering. Also, our products are designed and produced locally with sustainable fabrics, which is very pleasing to many local customers. Growing up, my mom Hertha, was a big influence on me. She would sew special outfits for my brother and I on Easter, Halloween and our yearly Christmas flannel pajamas were probably my favorite. One of my earliest memories was of making doll clothes from index cards my Dad brought home. I would use anything to adorn them, cotton balls or crayons, instead of sewing I preferred glue or staples to hold my designs together. Yes, ever since I was about 7 years old. My mom’s eye for the latest fashions, making her own patterns with newspaper seemed magical. Also, a family friend, who was an artist, came to our home to paint a mural on the walls of our kitchen. I remember him penciling in the design, while referencing to a photograph, mixing colors, then painting, watching his process was exciting. This was the beginning of my creative awareness. Check out more of Helga's designs online, and be sure to stop by her booth at the Minneapolis Gift & Art Expo, November 3-5, 2017 at the Minneapolis Convention Center! 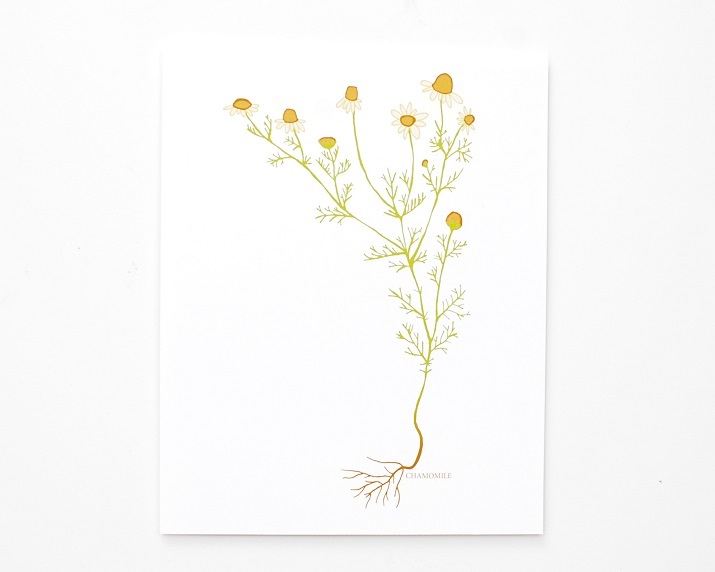 Trisha Lynn is a designer with a love for illustration and stationary. 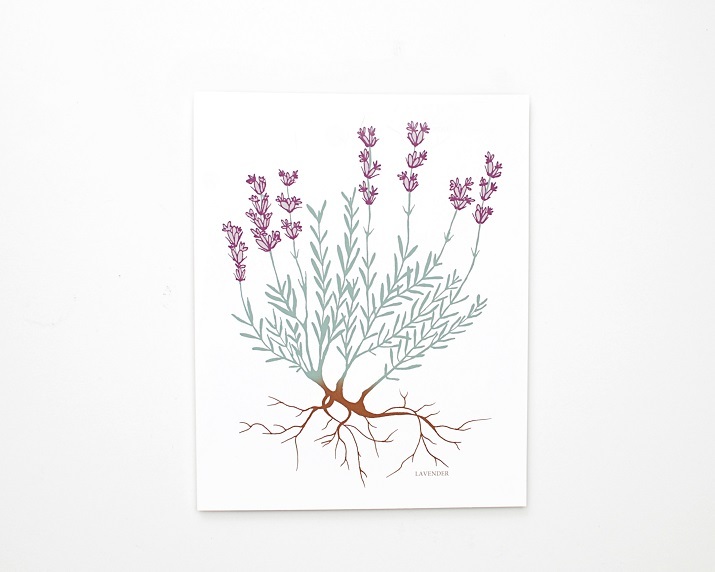 She combines her passion for art with practical needs, creating patterns and making prints. 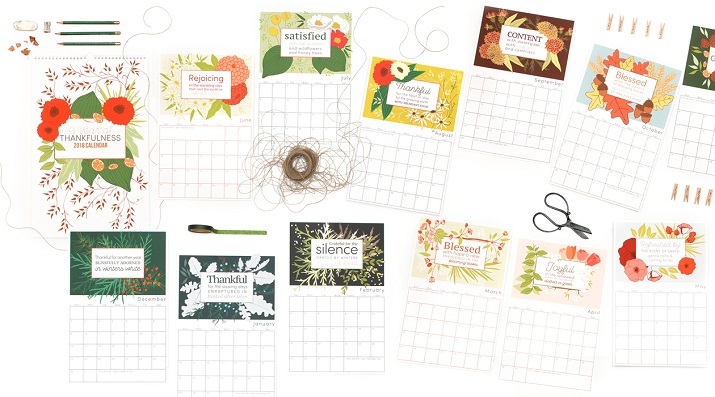 Her sweet cards are inspired by vintage botanical prints, and we especially love her "Thankful" themed 2018 calendar. What a perfect way to ring in the new year, with a reminder to have thankfulness with each month! I am Trisha Lynn, the artist and designer behind the stationery company Designs by Trisha Lynn. I have always loved illustration and in stationery I discovered a place where I could combine my love of drawing with something practical and useful. I gain much of my inspiration from nature and browsing antique stores. I opened my Etsy shop in 2015 and have done a lot of local shows as well as expanding my online shop. My first product was a botanical illustration of Pears (inspired by old school pulldown charts). Its been fun to continue to develop my style and develop new products. I am just completing my 2018 calendar. The focus of the calendar is on being thankful. Each month has a short poem expressing thankfulness for the season and has a place to add personal expressions of thankfulness for that month. The theme is dear to me this year as I have been through a lot of change and found it difficult to be thankful with so much upheaval in my life. So it’s been fun to develop the calendar and have my own mind focused on being thankful. I have loved art for as long as I can remember, and besides a brief stint of wanting to be a zookeeper, I’ve always wanted to do something with art. I took as many art classes as I could through school and then went on to get a bachelors in photography after high school. In college I rediscovered printmaking and post-college discovered pattern design. I loved how these art forms are both practical and able to be quickly reproduced. Both of those art forms are often used in stationery products, which guided me towards opening a stationery shop. When I was little I used to draw all of the time. I remember one day sitting in the car drawing in my notepad and for some reason I had this epiphany of how to draw a dog profile. It totally changed how I thought about drawing and was pretty much all that I drew for quite a while. I thought I was a pretty amazing artist. My favorite thing about being part of craft shows is getting to meet my customers. I always enjoy hearing what they like about my products or what suggestions they have for me. I also love meeting other artists in the shows and learning about their work and how they run their businesses. Check out more of Trisha Lynn's work online, and be sure to stop by her booth at the Minneapolis Gift & Art Expo, November 3-5, 2017 at the Minneapolis Convention Center! Betty Jean Christian got an unlikely start to her work as a jewelry artist; she began working with wire while assisting an orthodontist, bending wire in complicated ways to fit braces. Years later, she discovered wire for jewelry making, and it was a perfect fit for her skill set! She creates gorgeous wire jewelry for BJChristian Designs, from bracelets to earrings, that are as intricate as they are eye-catching. When I am at a show, or anywhere talking about my jewelry and someone says, "What fun designs! ", it is the best compliment. In that statement, they really get it. When I create my designs it is a fun process of enfolding from start to finish. I have been artistic and creating things my whole life. When I was a toddler, I hid under the bushes in front of our house making mud pies in the dirt after the rain. That was the first memory. Every year for Christmas I would receive some sort of craft or hobby kit to occupy my time while home for holiday break. Later, when I had my own children, I provided them with as much craft material as possible so they could create. Both of my daughters are very gifted artists. How did you start working in this particular craft? Creating wire jewelry may have originally started when I worked as a chair-side assistant for an orthodontist many years ago. We had training sessions where I was taught to bend wire for the patient's braces. It came very easy to me and I was called on to do some of the more complicated bends. Then many years later while perusing the internet, I saw something similar to the style of wire work that I do now. I bought how-to books, tools, and started bending with copper wire. I fell in love with it. I still have my very first bracelet and wear it occasionally. I soon began including sterling silver to my designs, and then gold-filled wire. I love making bracelets that include a variety of gemstones. Each one turns out so unique. When I finish one of these pieces I hold it in my hand and feel the energy of the stones together and with the metal and all the funky wire components, and it just feels good. I love it when the buyer of these pieces feel it too. Hard to explain. I have never offered rings in the past but I now have a ring design that I will be adding to my collection. It will be on the website in the next month or two and I will be bringing some to the Gift and Art Expo. I also have a very different style of bracelet in the works. Check out more of Betty's work online, and be sure to stop by her booth at the Minneapolis Gift & Art Expo, November 3-5, 2017 at the Minneapolis Convention Center! Winter is coming... but Namakan Fur has got us covered! Their team of winter-lovers has created the first ever detachable fur ruff. 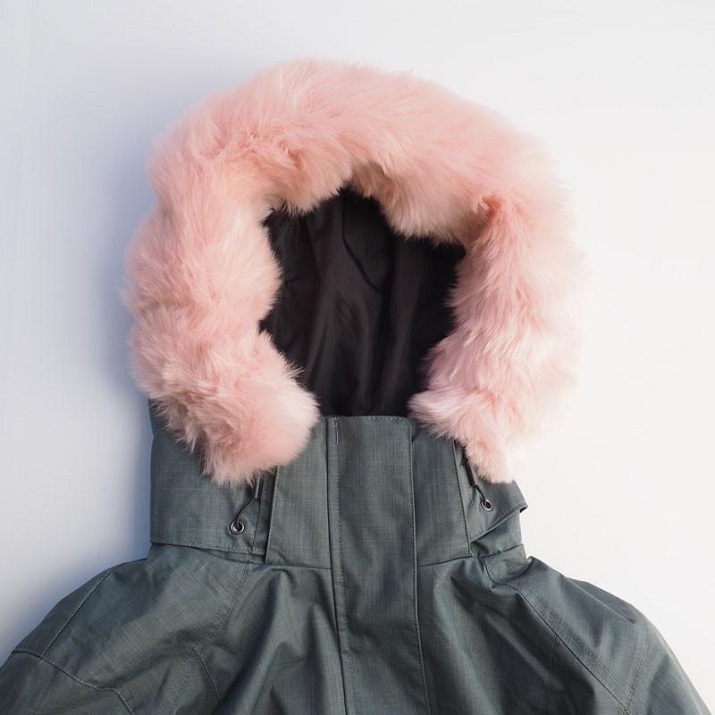 It fits on any jacket, and if you're from Minnesota where the weather is chilly from October to March, a fur ruff that can change with the seasons and styles is valuable! You'll want it from your fall denim jackets, to winter puffer coats, all the way to your spring trench coats. It will up the chic factor on any coat, and you'll be cozy no matter the weather forecast! As born and bred Minnesotans, we know that with the right gear, there’s no such thing as too cold. However, we’re often faced with the choice of looking great and freezing, or staying warm in frumpy gear. Namakan Fur bridges the gap between winter style and comfort, from the head down. Our first product is our original fur ruff– a stunning, American-made faux fur ruff that attaches to any hood with a magnetic design, adding a luxe and personal touch to your winter coat. Plus, a fur ruff keeps you warmer by creating an extra buffer between you and the cold. Simple! We’ve since added two additional fur ruffs, fur blankets, beanies with interchangeable magnetic fur poms. All our gear is winter themed, so while technically not focused on the holidays, it does have that vibe. Might I suggest our poms as adorable, unique stocking stuffers? We publicly launched our company with a successful Kickstarter campaign last fall, so technically this is our first crack at the holiday season. We’re preparing by drinking a lot of coffee and doing the occasional push-up contest. But really, as we’ve discovered great shows like Mpls Gift and Art Expo, we’re hoping this year to see how expert holiday shoppers check off their lists! Most of our customers live in cold weather climates (at least half of the year, anyway), and love that our ruffs keep them warm while adding pop of color on their otherwise boring winter coat. People constantly comment on the quality of our faux fur-- it’s soft, plush and luxurious and not as though it came from a Muppet. Many people also love the sustainable aspect of our ruffs-- they boost the longevity of an existing coat, breathing new life into a parka with a matted ruff or adding a touch of glamor to a wool coat’s collar. Yes-- and in diverse ways. Our founder and CEO, Maggie Davis, is a DIY genius. From renovating her own bathroom to building a butcher block table and reupholstering furniture, she simply loves to make things. Our product manager Liz Doyle went to school for fashion design and merchandising. She concurrently works as a stylist, pulling together impressive fashion shoots for national magazines. We know name dropping isn’t cool, but she’s even worked with Taylor Swift and the Williams sisters. Molly Mogren Katt wrote her published her first “magazine” at 10, lettered in yearbook (nerd alert! ), and would write for 10 hours a day if her dog and baby would let her. 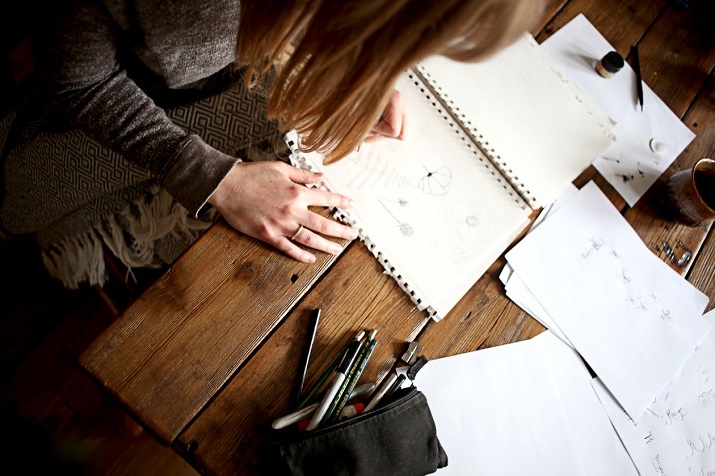 We love art and design, but have unique skill sets. We love our ruffs. They’re what launched our brand, which is focused on embracing winter. There’s nothing like them on the market. We’re currently pursuing a patent, which we’ve quickly learned isn’t cheap or easy, but is essential for taking our business to the next level. Honestly, it just seemed fun. And we thought our idea was too cool to simply talk about and never act on. We’ve since realized starting a business isn’t for the faint of heart, but at our core, it’s still fantastic to work on something innovative with people you love. In today’s market, you simply cannot find a versatile fur ruff that can be added or removed to any hooded winter coat. Consumers must decide whether they want a parka or jacket with a fur ruff when they purchase a coat. At that point, there’s two stumbling blocks. Parkas with high quality ruffs often come with a hefty price tag-- it’s not uncommon to pay $800+. More affordable parkas often come with cheap, often non-detachable ruffs that get matted within one season. At that point, your coat is ruined. And if your coat doesn’t come with a ruff, there’s no way to add one short of sourcing your own fur and having Auntie Kathy sew it on for you. Namakan brings a versatile way to add a quality faux fur ruff to any coat. At $68 retail, it’s an inexpensive way to upgrade your coat. And since our ruffs attach with magnets-- not zippers or snaps-- you can attach them to sweaters, vests or anywhere you’d like a luxe fur accent. We love winter, and there isn’t a place in the world that embraces winter like Minneapolis. We love the buzz at the grocery store in the hours before an impending blizzard. We love ordering pizza and snuggling up by the fireplace because it’s just too cold to go outside. We love bundling up and taking the dog off-leash on a frozen lake. We love hearing only the squeak of our boots on the snow on an otherwise silent winter night. Our love for winter influences everything we do. Voyageurs National Park, the Boundary Waters, the Minneapolis lakes, cabin life in northern Minnesota-- if you’re embracing the elements, we’re paying attention. We’re named after Namakan Lake in Voyageurs National Park. Not only is it a cool name (rhymes with mannequin), but it’s a place our founder and CEO visits annually with her family for an epic, multi-generational camping trip. Don’t be afraid to just go for it. Who cares if you don’t know how to use Quickbooks or build a website or make a line sheet for a tradeshow. You’ll figure it out, and usually you can find someone else a little farther down the maker line who will help. This is an incredibly helpful and collaborative community and we love being a part of it. Check out more of Namakan Fur's products online, and be sure to stop by their booth at the Minneapolis Gift & Art Expo, November 3-5, 2017 at the Minneapolis Convention Center! Terry Meyer has a true admiration for the energy of his subjects; his abstract paintings and metal sculptures capture the calm of sailboats and the power of wild horses. Terry has had a passion for art his entire life, and he seems to encapsulate the essence of his subjects with abstract brush strokes and dreamy color palettes. It's not uncommon for his viewers to have an emotional response to his large scale paintings and sculptures, and it's easy to see why. I am a self taught artist living in Eau Claire, WI, working mostly in oil and watercolor painting, but also do welded sculpture. I would say that I’ve always been an artist, and only in the last 10 years have I been able to address my passion full-time. I was a teacher for 30 years, and the art got done in between and at night. I love working with many different mediums including clay, paper, wood, metal and other materials. My work is shown in several galleries throughout the US including Woodbury, MN; Jackson Hole, WY; Durango, CO; Tubac, AZ; Hudson,WI, Eau Claire, WI; and Paoli,WI. Many of my pieces have been in both private and corporate settings. Although I paint everyday for several hours, metal sculpture has been my focus for the last few months. I recently completed a 10’ three horse, welded sculpture which is currently on display in Eau Claire as part of our juried Sculpture tour. Another recently finished sculpture (of two horses) titled “The Dance” is available for viewing and purchase at the Kelley Gallery in Hudson, WI. What do your customers love most about your work? Reactions to my work are most gratifying, especially as I meet people at events where I’m showing. The power, motion and energy reflected in my work seem to affect people very profoundly. Their positive reactions indicate an appreciation for the abstract, essence of the work, evoking an emotional reaction. Much of my work is large scale, and there is always interest in the large statement it makes. It is the dynamic, accepting nature of this growing city (Eau Claire, WI) that influences my work. Age groups across the spectrum, from millennials to baby boomers, are collaborating to create an artistic energy in Eau Claire, which I’m proud to be a part of. It’s been great to get caught up in this momentum and as a result, has broadened the scope of my work. The color and lines of nature, the power and energy of horses, and the peaceful presence of sailboats are my main inspirations as reflected in the work. But it is the essence of an object or animal that I assimilate into a piece. I don’t paint copies of my subject matter, I paint their essence. Check out more of Terry's work online, and be sure to stop by his booth at the Minneapolis Gift & Art Expo, November 3-5, 2017 at the Minneapolis Convention Center!